In deze mail staat een link waarop het zestiende DKARS-Magazine is te downloaden. This mail contains a link which the sixteenth DKARS-Magazine is available for download. Want to download a PDF instead of browsing Magazine on-line? [SOC] Is it collecting our email address's ? Its common knowledge on the streets and amateur radio equipment manufactures that we outnumber the first class operators 20 to 1. My logic is most likely flawed, seems to me that our www site will be hacked more often than others and strange www links posted. Are some of these links there just to identify active email address's for later use ? A email harvester of sorts. By the time your reading this email I've posted to the SOC somebody at the arrl headquarters is probably wondering if either the wouffhong or the rettysnitch will make it through airport security for transport to Alaska. To deal with people for asking such questions about posts to our SOC forum. These people even have a organization & www site. 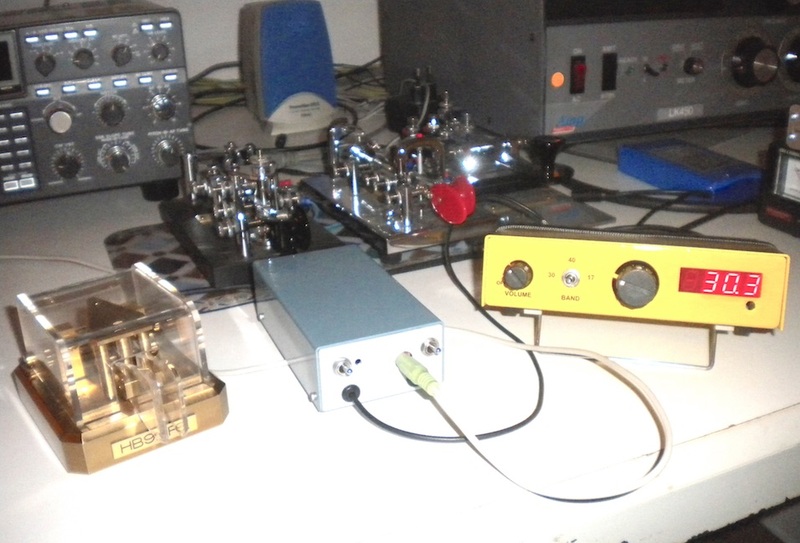 And yes, I use a vibroplex bug key and my cw qso's last longer the usual 12 to 15 seconds. Vibroplex, known instrument of TORTURE. Especially with LONG dashes and a few extra dits for seasoning. 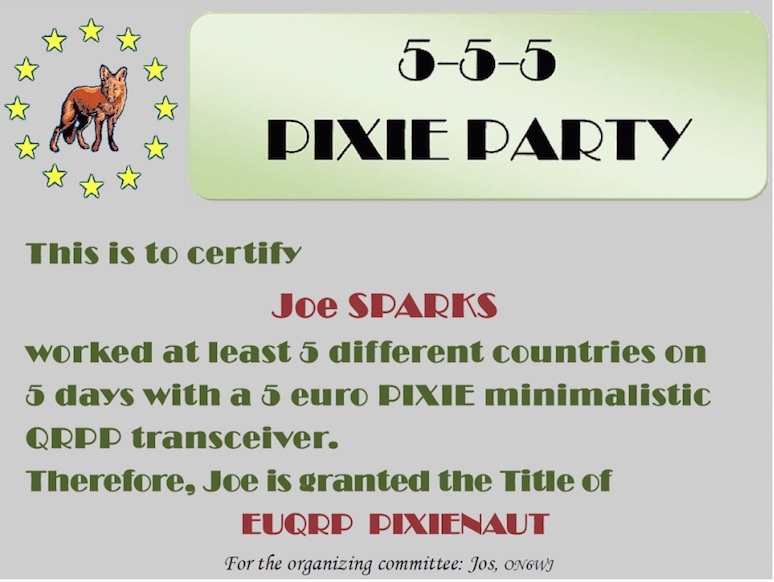 I can hear it now: A L 7 J K PLS K.
FYI, some Pixie and Sputnik info from Jos – ON6WJ, see below. …ONLY 10 days left to achieve your “555Award”!! He writes :made from recycling hardware, modified for best Z-adapting 4-16 ohm input . 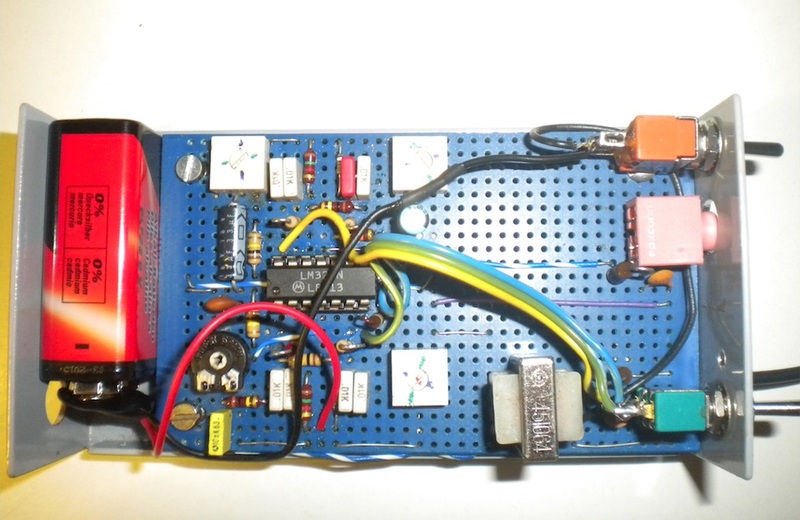 Output is for little amplifier like LM 386 on battery. - the "Sputnik activity days” are launched some 24 hours ago!! Tnx Oleg, RV3GM for update. Some news from the Sputnik gang, Jos – ON6WJ, Oleg – RV3GM et al, see below. Jos is QRV tonight with his Sputnik at 1900 UTC on +/- 3550 3560 3575 kHz, QSO wanted. Good luck Jos, keep up the good work. Dear SPUTNIK & Low Power minded radio Friends. Lately a bit busy with my new "SPUTNIK MK2-made-in-Belgium” (sri some backlog orders for a special Russian customer) but finally could make a lot of steam whoehahaha (the 2 tubes in PP are 1P24b) for the moment 80 meters is alive and kicking ! Tonite hope to make my first beep beep beep QSO on 80 meters. If someone could be QRV around 19:00 UTC ? +/- 3550 3560 3575 KHz will be beeping there curious but my rocks are “vibrating” nearly 1 KHz higher then in other transmitters schematic = Frank C.Jones Push Pull Transmitter (Radio Handbook 1937). Front tank coils are wound on big Syringes in octal sockets change of bands ? Just other “tankcoil" and another “rock"
Dear Space Friends, don't forget to send reports about your Sputnik/Vanguard QSOs/SWLs, please. Also pictures, schemes of your TXs are appreciate to add on the Sputnik gallery. Victor UA1CEX operate on the old valves military TX 1 W G5RV on 20 m.
Peter PA0PJE informed he QRV on 21 MHz on Sputnik clone TX with two "rod" valves. Also Peter operate on 20 m with Vanguard TX on Ge pnp AF118 transistors 40 mW. transistors) together with DC RX also on old Ge types transistors (CQ and RBNs reports so far only). Sorry, I have not info about Sputnik/Vanguard QSOs for the moment.